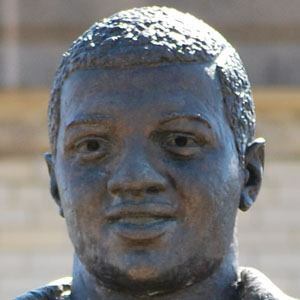 The first African-American athlete to win the Heisman Trophy. He helped break the color barrier in college football. He was bigger than most kids on his youth football squads, so rather than tackling them, he picked them up off the ground until the whistle sounded. He was a talented running back at Syracuse, and an able defensive back, leading his team to two straight undefeated seasons. After his parents divorced, he went to live with his grandparents in Uniontown, Pennsylvania. Rob Brown played him in the 2008 Universal Pictures biopic The Express: The Ernie Davis Story.